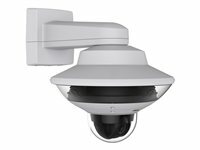 AXIS Q60 PTZ Dome Network Cameras are designed for the most demanding video surveillance applications, with outstanding, full frame rate video in resolutions up to HDTV 1080p. With powerful zoom and high-speed, precision pan/tilt/zoom capabilities, the indoor and outdoor-ready PTZ domes enable exceptional coverage of large areas and great detail when zooming in. With quick and reliable installation features, the cameras are ideal for airports, seaports, stadiums, manufacturing plants as well as city and perimeter surveillance. Zero in on problem areas AXIS Q6000-E Mk II also give you the option of replacing the standard lens in one or more sensors with either a 6 mm or 16 mm tiltable lens and upgrading the resolution to HDTV 1080p. Then you can use that sensor to focus on an area of particular interest. Sharp images, low bandwidth AXIS Q6000-E Mk II also features Axis' Zipstream technology, which significantly lowers bandwidth and storage requirements while preserving high-quality images and forensic detail. Quick and easy installation Any AXIS Q60-E is quickly and easily mounted inside the AXIS Q6000-E Mk II. There's no need for extra mounting brackets or other extra equipment because the two cameras use the same brackets and network cable. Power over Ethernet is supplied to both cameras through AXIS Q6000-E Mk II, which simplifies installation even more. 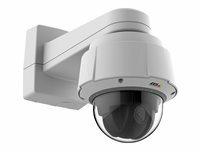 AXIS Q6044-E is a top-of-the-line, outdoor-ready PTZ dome providing HDTV 720p, 30x optical zoom, and fast and precise pan/tilt performance for wide area coverage and great detail when zooming in. It is ideal for city surveillance, airports, train stations, harbours and stadiums. 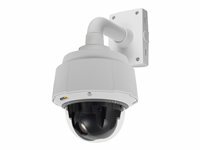 Wide area coverage AXIS Q6044-E is a top-of-the-line, outdoor-ready PTZ dome providing HDTV 720p, 30x optical zoom, and fast and precise pan/tilt performance for wide area coverage and great detail when zooming in. It is ideal for city surveillance, airports, train stations, harbors and stadiums. Reliable operation Designed for easy and reliable installation, the camera is vandal-resistant (IK10) and has shock detection, surge protection (railway standard), and protection against dust, rain and snow (IP66 and NEMA 4X). It can operate in temperatures ranging from -40°C to 50°C (-40°F to 122°F). The camera's arctic temperature control ensures safe start-up in extreme cold. Intelligent video Support for active gatekeeper enables the camera to automatically move to a preset position when motion is detected in a pre-defined area, and track the detected object. The camera also has substantial capacity for third-party intelligent video applications that are based on the AXIS camera application platform. AXIS Q6044-E has a built-in memory card slot for local storage of recordings. For demanding conditions Sweeping overviews and zoomed-in detail. Instant focus and good image quality even in low light. 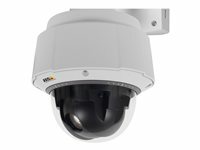 AXIS Q6054 Mk III is an advanced PTZ camera that gives you all that. Designed for demanding conditions, it's ideal for surveillance at airports, train stations, arenas, malls, warehouses and factories - anywhere you need fast and precise, round-the-clock pan/tilt/zoom operation. In focus in an instant Focus recall helps you get more out of your AXIS Q6054 Mk III in challenging light conditions. There's no need to focus manually or wait the second or two it takes for autofocus to adjust. Focus recall gives you instantaneous focus even in low-contrast scenes. Good image quality - around the clock AXIS Q6054 Mk III features a sensor that makes it highly light-sensitive and comes with Lightfinder technology. That means you can count on good image quality even in low-light scenarios and dark environments. AXIS Q6054 Mk III also features WDR, which ensures excellent detail when there are both bright and darker areas in a scene. Sharp images, low bandwidth AXIS Q6054 Mk III features Axis Zipstream technology, which analyzes the video stream in real time to identify areas of interest. These areas are compressed a bit less than other areas, preserving important details in full image quality. In focus in an instant Focus recall helps you get more out of your AXIS Q6054-E Mk III in challenging light conditions. There's no need to focus manually or wait the second or two it takes for autofocus to adjust. Focus recall gives you instantaneous focus even in low-contrast scenes or scenes with point-shaped light sources such as headlights in oncoming traffic. Good image quality AXIS Q6054-E Mk III features a sensor that makes it highly light sensitive. That means you can count on good image quality even in low-light scenarios and dark environments. AXIS Q6054-E Mk III also features WDR, which ensures excellent detail when there are both bright and darker areas in a scene. Sharp images AXIS Q6054-E Mk III features Axis technology, which analyzes the video stream in real time to identify areas of interest. These areas are compressed a bit less than other areas, preserving important details in full image quality, while reducing storage and bandwidth. Get up close and personal AXIS Q6055 features 32x optical zoom, which in combination with HDTV 1080p resolution provides superb zoomed-in views of people and objects of interest. For instance, you'll be able to see the expression on a person's face from some 100 meters (328 ft.) away. Analytics protect your bottom line AXIS Q6055 comes with a long list of built-in Axis analytic applications that allow automatic monitoring of the video feed and help you prevent crime before it happens. Analytics can also help you make smarter decisions about resource allocation and cut down on routine patrols, for example. Sharp images, low bandwidth AXIS Q6055 also features Axis Zipstream technology, which significantly lowers bandwidth and storage requirements while preserving high-quality images. 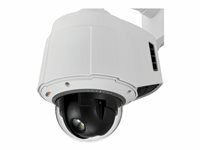 For demanding conditions AXIS Q6055-E is an advanced PTZ dome that gives you both sweeping overviews and superb zoomed-in detail. Designed for demanding outdoor conditions, it's ideal for surveillance at airports, train stations, arenas, and any city-surveillance scenario - anywhere you need fast and precise, round-the-clock pan/tilt/zoom operation. Get up close and personal AXIS Q6055-E features 32x optical zoom, which in combination with HDTV 1080p resolution provides superb zoomed-in views of people and objects of interest. For instance, you'll be able to read the license plate on a car from some 300 meters away. Analytics protect your bottom line AXIS Q6055-E comes with a long list of built-in Axis analytic applications that allow automatic monitoring of the video feed and help you prevent crime before it happens. Analytics can also help you make smarter decisions about resource allocation and cut down on routine patrols, for example. Our partners also offer a wealth of additional advanced analytics applications that can be integrated into AXIS Q6055-E.zipstream-article-spotlightSharp images. Low bandwidth.AXIS Q6055-E also features Axis' Zipstream technology, which significantly lowers bandwidth and storage requirements while preserving high-quality images. Analytics protect your bottom line AXIS Q6055-E comes with a long list of built-in Axis analytic applications that allow automatic monitoring of the video feed and help you prevent crime before it happens. Analytics can also help you make smarter decisions about resource allocation and cut down on routine patrols, for example. 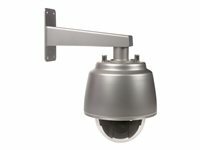 Wide application for stainless steel and nitrogen AXIS Q6055-S is a high-speed surveillance camera in a pressurized, marine-grade stainless steel casing. The robust camera is designed for round-the-clock pan/tilt/zoom operation, providing HDTV 1080p and 32x optical zoom with autofocus for 360° coverage of wide areas and great detail when zooming in. The highly durable, outdoor-ready camera is ideal for many applications that can take advantage of the benefits of stainless steel and pressurized nitrogen. Outdoor applications include marine, mining, and oil and gas environments. Indoor applications include food, medical and clean room manufacturing facilities. High durability With a stainless steel casing and a nylon clear dome cover, the camera has high resistance to the corrosive effect of sea water and cleaning chemicals. The camera can operate in -30 °C to 50 °C (-22 °F to 122 °F) and its MIL-STD-810G 509.5, IP6K9K, IP66, IP67 and NEMA 4X approvals ensure protection against salt fog, high pressure and steam jet cleaning, dust, rain, snow and ice. Sharp images, low bandwidth AXIS Q6055-S also features Axis Zipstream technology, which lowers bandwidth and storage requirements by an average of 50% or more while keeping the resolution, frame rate and forensic details. Zipstream automatically adapts to PTZ camera movements. Intelligent video AXIS Q6055-S comes with built-in basic analytics such as highlight compensation, object removed, fence detector, object counter and enter/exit detection. It also supports Autotracking and Active Gatekeeper. With Active Gatekeeper, the camera can automatically move to a preset position when motion is detected in a pre-defined area, and track the detected object. The camera also has substantial capacity for third-party intelligent video applications.